IMAGE: Graph shows the location of the genetic effect for the gene FOXC1. Researchers from Massachusetts Eye and Ear/Harvard Medical School and Case Western Reserve University School of Medicine have led an international effort to identify three genetic associations that influence susceptibility to primary open angle glaucoma — the most common form of adult onset glaucoma and the leading cause of irreversible blindness in the world. In the largest genome-wide association study of its kind, the investigators studied more than 4,000 cases and 30,000 controls for primary open angle glaucoma using human genomes collected through the NEIGHBORHOOD consortium, a National Eye Institute collaborative. The researchers identified relationships between primary open angle glaucoma and three genetic associations: TXNRD2, ATXN2 and FOXC1. The findings, published in the current issue of Nature Genetics, provide key insight that may ultimately be used to develop gene-based testing and treatment strategies for glaucoma. "We have identified three new genetic associations for primary open angle glaucoma, and each one tells an interesting story about the disease," said Janey Wiggs, M.D., Ph.D., co-director of the Glaucoma Center of Excellence at Mass. Eye and Ear and a principal investigator on the study. "Previously, we had very little insight into the actual molecular events that contribute to this disease." Glaucoma is a condition in which a rise in eye pressure can lead to irreparable damage of the optic nerve, which connects the eye to the brain. The increase in pressure is caused by dysfunctional drainage in the front of the eye. As fluid accumulates in the eye, intraocular pressure rises, and when that pressure rises above a certain level, it damages the optic nerve. In advanced stages of the disease, patients become completely blind. Primary open angle glaucoma is the most common form of the disease, and refers to glaucoma that progresses quietly as the drainage canals become damaged over time. Current treatment for glaucoma is limited to preventing permanent damage to the optic nerve; therefore, early detection and regular monitoring are essential to preserving eye health in glaucoma patients. However, glaucoma often progresses to advanced stages without any noticeable symptoms. "The goal of this work is not only to increase our ability for early detection, but also to define molecules that, when they are dysfunctional, can contribute to disease. This is the critical insight that we need before we can develop gene-based screening tests to identify genetic risk factors and, ultimately, any gene-based therapy," said Jonathan L. Haines, PhD, chair of Epidemiology and Biostatics and the Mary W. Sheldon, MD, Professor of Genomic Sciences Case Western Reserve University School of Medicine. TXNRD2: The researchers found an association between primary open angle glaucoma and reduced levels of TXNRD2, a mitochondrial protein that naturally regulates the production of a reactive oxygen species in cells. Without enough TXNRD2, the reactive oxygen species can accumulate to the point of causing the mitochondria to prematurely die, ultimately destroying the cell. This evidence suggests that mitochondrial dysfunction can lead to glaucoma. ATXN2: It is known that mutations in the gene ATXN2 cause severe neurodegenerative diseases, such as amyotrophic lateral sclerosis (ALS), and the variance in the gene that causes those diseases is the type of mutation that causes a severe early onset phenotype. 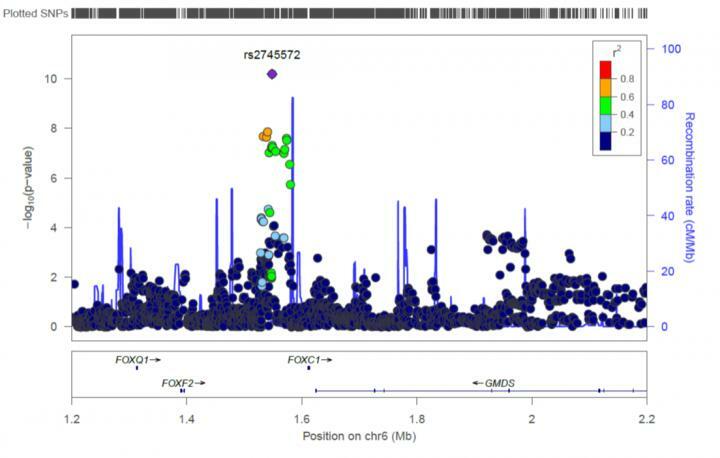 The researchers found that genetic variants located in regions that regulate ATXN2 expression is associated with primary open angle glaucoma. This finding suggests that there may be an emerging relationship between glaucoma and severe neurodegenerative diseases, and particularly, ALS. The researchers hope to use this new knowledge to develop gene-based screening to promote early detection and, eventually, gene therapy strategies for patients with glaucoma. "The genetic studies are beginning to define molecules that, when they are dysfunctional, can contribute to disease. This is critical insight that we need before we can develop gene-based screening tests to identify genetic risk factors and, ultimately, any gene-based therapy," said Dr. Wiggs. "We hope to have the opportunity to understand enough about this basic molecular biology of the disease that we can begin to target critical molecular events with gene-based therapies. This work was supported by the National Eye Institute grant EY022305. Mass. Eye and Ear clinicians and scientists are driven by a mission to find cures for blindness, deafness and diseases of the head and neck. Now united with Schepens Eye Research Institute, Mass. Eye and Ear is the world's largest vision and hearing research center, developing new treatments and cures through discovery and innovation. Mass. Eye and Ear is a Harvard Medical School teaching hospital and trains future medical leaders in ophthalmology and otolaryngology, through residency as well as clinical and research fellowships. Internationally acclaimed since its founding in 1824, Mass. Eye and Ear employs full-time, board-certified physicians who offer high-quality and affordable specialty care that ranges from the routine to the very complex. U.S. News & World Report's "Best Hospitals Survey" has consistently ranked the Mass. Eye and Ear Departments of Otolaryngology and Ophthalmology as top in the nation. For more information about life-changing care and research, or to learn how you can help, please visit MassEyeAndEar.org. Founded in 1843, Case Western Reserve University School of Medicine is the largest medical research institution in Ohio and is among the nation's top medical schools for research funding from the National Institutes of Health. The School of Medicine is recognized throughout the international medical community for outstanding achievements in teaching. The School's innovative and pioneering Western Reserve2 curriculum interweaves four themes–research and scholarship, clinical mastery, leadership, and civic professionalism–to prepare students for the practice of evidence-based medicine in the rapidly changing health care environment of the 21st century. Nine Nobel Laureates have been affiliated with the School of Medicine. Annually, the School of Medicine trains more than 800 MD and MD/PhD students and ranks in the top 25 among U.S. research-oriented medical schools as designated by U.S. News & World Report's "Guide to Graduate Education." The School of Medicine's primary affiliate is University Hospitals Case Medical Center and is additionally affiliated with MetroHealth Medical Center, the Louis Stokes Cleveland Department of Veterans Affairs Medical Center, and the Cleveland Clinic, with which it established the Cleveland Clinic Lerner College of Medicine of Case Western Reserve University in 2002.http://www.case.edu/medicine.